Key Largo Fishing Charter "Lets Go Fishing!" Backcountry and flats fishing the waters of Key Largo, Florida is not only one of the best experiences you will ever have fishing it is also a lot of fun. 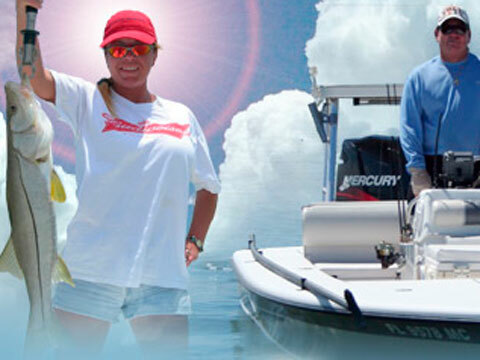 Captain Kerry Wingo has been having fun and fishing the flats and backcountry waters of Key Largo for over 20 years. These waters are teeming with some of the best sport fish in the world. Tarpon, bonefish, permit, snook, barracuda, redfish, and even sharks are just a few of the many fish that call these waters home. Key Largo Fishing Captain Kerry will bring you to and teach you how to land and catch all of these fish but he like many of his associates promotes the â€œcatch and release fishing programâ€ so do not forget your camera. Also the waters and area where you will be fishing is full of many different types of wildlife. On any given trip you may see many different types of birds; bald eagles, brown and white pelicans, osprey, and spoonbills are just a few. Also in addition to the fish that you will catch you might get lucky and have some dolphins swim by the boat and even might see a saltwater crocodile or manatee so your camera will perform double duty. A Key Largo fishing charter with Captain Kerry if you are a beginner or a pro is an adventure he knows you will enjoy.